The ski season may be winding down in some resorts but there’s still plenty of action available, especially at those resorts lucky enough to feature a permanent glacier. To take advantage you’ll need some top quality gear. Luckily, as showcased by the most important ski industry trade show in the world (SIA), 2019 has been a great year for quality, affordable gear bringing in all the latest trends and technologies. Helmets are an underappreciated but crucial element of this. 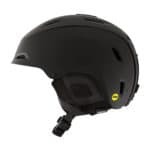 Most skiers report that they ski better when wearing a well-fitted, comfortable helmet – precisely because it makes them feel safe. 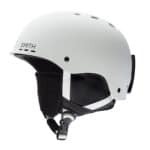 According to the New York Times, wearing a helmet cuts the risk of serious head injury when skiing by half and, should an injury occur, the severity is likely to be reduced considerably. The trend right now is for lighter head gears with a balance of good ventilation and protection. We’ve also seen the rise of quirkier tech such as support for bluetooth. 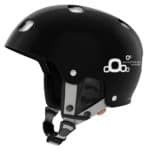 Despite this, helmets still look much the same as they have for the past decade – so if you’re expecting any futuristic twists you might have a while yet to wait. Built for the hard-core enthusiasts. 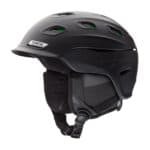 This helmet maximises security and features impressive ventilation with an increased airflow compared to most competing helmets. It offers a 360º halo design, which results in a better fit for most wearers. The Vantage MIPS is produced with the Smith SirEvac technology for easy goggle integration, and it’s a simple if stylish looking helmet too. 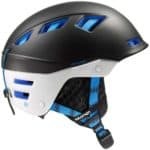 This Giro helmet has a really innovative fit system, which makes it more than flexible enough for the majority of skiers. The ventilation is adjustable, and though our testers preferred that of the Smith Vantage’s, it is still a quality system and is likely to suit the average user. The design is comfortable thanks to a soft insulation liner on the interior. One possible downside is that the ear pads are not compatible with some audio-systems. This helmet offers a nice balance between toughness and weight. It is lightweight, but still secure thanks to its design. The interior is padded and comfortable almost to the same degree as the more expensive Vantage model. The Variance does have an inferior ventilation system, but still a strong offering at this price point. The reason this helmet is ranked so high in the list, is related to the extremely good value price price, but that doesn’t mean this helmet should only be considered by those on a budget. The quality, comfortable interior is reason enough for inclusion. 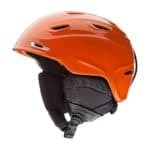 This helmet is also light weight and versatile enough to be used for summer activities as biking. It does have its shortcomings, as you’d expect at such a price – the ventilation system is lacking and you might struggle to find a compatible pair of goggles unless you’re happy to shop around. The focus of this product is its safety-first design. 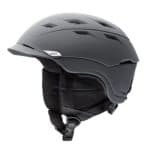 The helmet offers a very secure experience with practically no penalty on the weight, however it does lack the comfort of the Vantage or the Smith Variance. Despite its hardy shell, this gear has a really good ventilation thanks to the large adjustable vents. We rank this as one of the best choices for an aggressive skier. 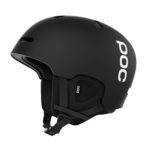 This is one of the better ski helmets that you can find around the £40-45 price point. While some helmets in this category can appear cheap, this helmet really looks the business. The fit system is innovative and well done. It offers competitive comfort, warmth and ventilation. The biggest problem is definitely its durability; the foam on the interior is not of fantastic quality, and might not last with regular use. It may have its shortcomings but at the end of the day the Smith Holt is an excellent choice for the casual skier. An interesting helmet due to its quality balance at a lighter weight. The Salomon MTN Lab (matching boots are also available in the same product line) offers secure, full coverage protection and a highly competitive ventilation system. All this while maintaining an impressively light weight (450-550g). The comfort isn’t the best – in order to keep that weight down the amount of padding may be an issue for skiers who like a particularly cozy fit. The helmet has a really well-cushioned interior, which makes wearing it a comfortable experience. The fit system is well-made and can be easily adjusted vertically and around the head. 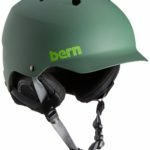 It offers a good durability while being on the lighter side of the helmets we’ve looked at this year. We reckon this represents a good choice for the resort skier looking to take advantage of a competitive price. The ventilation is the only lacking aspect – the vents are rather small. The strongest points here are toughness and security. This helmet is an especially good match for free skiing. The thick outer shell gives this product improved durability but it does come at the price of a higher weight. The interior is made of special foam material, which is supposedly much more durable than the oft-used EPS foam. Minimalist padding does make for an inferior comfort compared to helmets higher on this list, however. It also feels heavy, but has a well-built ventilation system that allows heat to escape through the relatively large vents. The Smith Aspect has a comfortable interior, offers a good fit system and an integrated goggle clip. 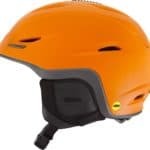 The helmet is lightweight and has, for the price, an impressive ventilation system with 10 adjustable vents. The durability is really competitive for its cost and is perhaps only second to the Salomon MTN Lab, in this price category. The interior liner is of noticeably lower quality compared to more expensive helmets. It also has a stiff dial that serves as a fit adjuster, which you’ll struggle to action without removing your gloves. 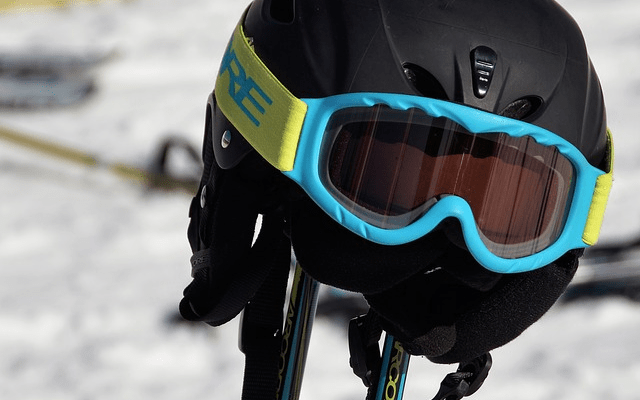 We’ve not touched on mounted cameras or audio systems in this round-up, but keep your eyes out for our summary of the best systems out there for the late ski season. Looking for somewhere to test out your new gear? Try SkiWorld Chalet & Holiday offers.